Our names are Tom and Carolyn Ward and we are currently responsible for Cherokee County. Are you interested in hosting one of the KSGenWeb orphan counties? If so contact Orphan County Coordinator. Information about the responsiblities of a county host can be found by clicking here. Cherokee County in Pictures and Prose published in 1923. 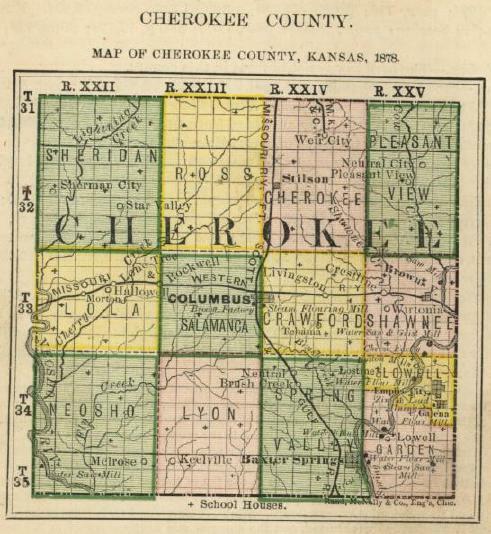 Polk Directory - Cherokee County Section, published in 1912. During the years 1917-1919 a state guard was formed in Kansas. The 44th Battalion had companies in Baxter Springs, Columbus, Galena, and Scammon. Includes a history and roster. GALENA PUBLIC LIBRARY -- 315 W. 7th, Municipal Building, Galena. 620-783-5132. WEIR CITY LIBRARY -- Weir. 620-396-8472. FOUR STATE GENEALOGY SOCIETY -- 922 Galena Ave., Galena.